Kate Zeigler, J. Michael Timmons, Stacy Timmons and Steve Semken [editors], 2013, 237 pages. 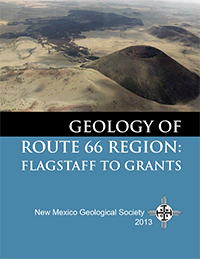 Following along portions of historic Route 66, the 64th annual New Mexico Geological Society’s fall field conference travels through the spectacular geology of northeastern Arizona and western New Mexico. Beginning with one of most remarkable geologic phenomena on Earth — Grand Canyon — the trip visits a wide variety of features in the Route 66 region between Flagstaff and Grants, including other national parks and monuments, such as Wupatki, Sunset Crater, Petrified Forest, and El Malpais. As the trip crosses this remarkable terrain, the topics discussed include everything from Proterozoic basement rocks to Neogene volcanism, with Paleozoic and Mesozoic sedimentary rocks in between. Detailed road logs describe the regional geology and history along the route, plus additional optional side stops. This volume also includes fourteen technical manuscripts, as well as shorter minipapers, covering topics from mineral resources, hydrogeology, geoscience education, and volcanology to geomorphology and geochronology, with additional highlights to the regions’ history, art and archaeology. There are two versions of this guidebook available — the complete guidebook (237 pages), and a version with just the road logs that is spiral bound (117 pages). — W. A. Duffield, pp. 1-8. — J. Michael Timmons, Carol Dehler, Karl Karlstrom, Laura Crossey, and Susannah Porter, pp. 5-7. — Karl Karlstrom, Laura Crossey, and Ryan Crow, pp. 7-8. — Kate Zeigler, Nancy Riggs, J. Michael Timmons, Michael Ort, and Steve Semken, pp. 9-24. — Allyson Mathis, Robert J. Lillie, and Steve Semken, pp. 20-22. — Kate Zeigler, Steve Semken, and Carleton Moore, pp. 22-23. — Kate Zeigler and Steve Semken, pp. 23-24. — William Parker, Jeffrey Martz, Kate Zeigler, Steve Semken, and J. Michael Timmons, pp. 25-42. — Will Keener, pp. 43-45. — AnnD. Zeigler and Paul S. Zeigler, pp. 45-47. — AnnD. Zeigler and Paul S. Zeigler, pp. 47-49. — Kate Zeigler, J. Michael Timmons, and Steve Semken, pp. 50-53. — Virginia T. McLemore, pp. 54-55. — Niranjan K. Khalsa, Brad Hill, and Dan Kapostasy, pp. 56-58. — Larry Crumpler and Fraser Goff, pp. 59-65. — Larry Crumpler and Fraser Goff, pp. 66-67. — Fraser Goff and Cathy J. Goff, pp. 67-69. — Shari Kelley, Nelia Dunbar, William McIntosh, and Fraser Goff, pp. 70-72. — Nelia Dunbar, Shari Kelley, Fraser Goff, and William C. McIntosh, pp. 72-74. — Larry Crumpler, Jane Aubele, Jim R. Zimbelman, Steve Self, Jake E. Bleacher, and Brent Garry, pp. 75-85. — Colin T. Cikoski, Dan K. Koning, Kate Zeigler, and J. Michael Timmons, pp. 86-96.